So it’s a New Year and most of us will use this opportunity to reflect and plan for our future. Whether we’re making personal goals, business plans or launching a new venture, here are some key steps to planning for success. These SMART goals are simple and effective. Be as specific and clear as possible, so you will know precisely when you’ve reached your goal. Vague over ambitious statements, might work when it comes to defining a vision, but your goal must get straight to the point. It seems simple but we often set goals without an action plan. Creating a road map, that outlines the key steps towards your end goal, will help chart and measure your progress. So set your milestones, track and measure your results. The best part is, you can reward yourself every time you reach a key milestone. A great way to achieve your goals is to make it public and to be accountable to someone. You might want to consider using a personal coach or mentor to help check your progress at each stage. Often the fear of failure can hold us back from making our goals a reality. Assessing the risks together with your current limitations is the key to overcoming those stumbling blocks. Make a list of everything you need to be successful, and be resourceful. Setting a timeframe for your goal is a sure way to being successful in all your ventures. It will help you to put things in perspective and enable you to focus. 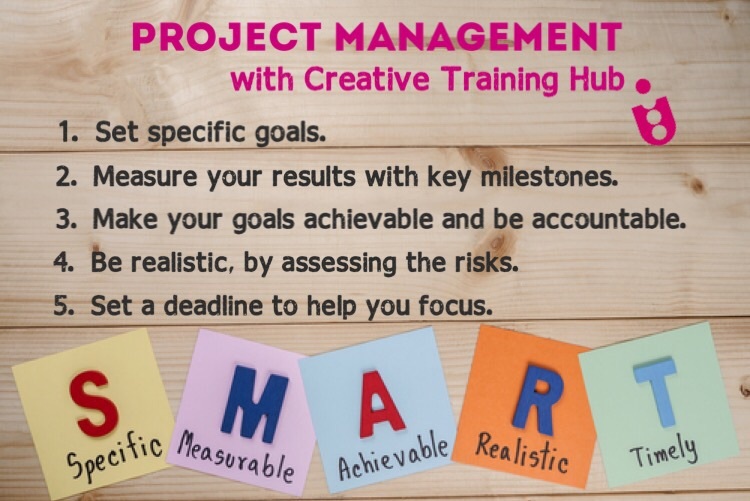 Find out how you can make all your projects a success and book a place on our one-day training course.